Two ladies walked in to the office a week or so ago and the mom of the two said she wanted to become an individual member of Main Street Guymon. Not recognizing them, I asked how they knew about Main Street. It seems they moved to Guymon in December and they had just seen and read about the Main Street programs and wanted to get involved. Been there when you have those weeks that just don’t seem to ever get over? I had had a long week with meetings and you know how meetings can take all your time and you don’t get much of a chance to get things done on your TO DO list but each meeting certainly adds to it? Those are the weeks that everyone’s “help” and ideas really aren’t appreciated because you have things that you HAVE to get done that are overdue and it just gets a little overwhelming … even when you know that they are really just trying to help. And the truth is that it might be helpful if it were anytime but THAT week, you know? Then you have someone walk in like Pam Conner who says such kind and positive things and it just puts the world back in perspective. And then I am OK with getting done what I can in my day and not kicking myself (or anyone else) for not getting any more done. Thank you, Pam Conner. Thank you for becoming a Main Street member and thank you for saying such wonderful things about our programs. I think when you meet our Main Street volunteers, you will just love them. And welcome to Guymon to you and your whole family. We are so glad to have you all here. While were talking about wonderful folks … thank you to Emily Alcocer and her faithful crochet folks for their Crocheting for Charity. If anyone would like to join them as they work the needles, please join. Call 338-6246 for more information. For those wanting to being living a healthier lifestyle, there is a six week class being offered at the library. This class addresses pain, fatigue, and the inability to sleep. The instructors will share activities that help to improve strength, exercise, endurance, and safe use of medications. This course is designed for individuals or caregivers of those who have chronic health problems and want to improve their overall health through a positive approach. The course will address better breathing, techniques to control sleeplessness and pain and fatigue and depression, ways to prevent falling, relaxation skills, and more. It starts Aug. 2 and is held every Wednesday from 1 – 3 in the afternoon until Sept. 6. Anyone interested in learning more about Guymon’s Cultural District Initiative is invited to a public meeting on Aug. 3 at 6:30 pm in the Galleon Restaurant meeting room. They are looking for committee members who are diverse from business owners and managers, culturally specific and social service and religious organizations, people from educational institutions, professional groups, artists, and those in government. 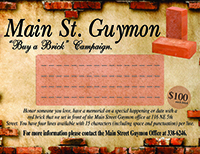 Be a part of what’s happening or going to happen in Guymon. Be someone’s Pam Conner. And come and see us on the bricks!